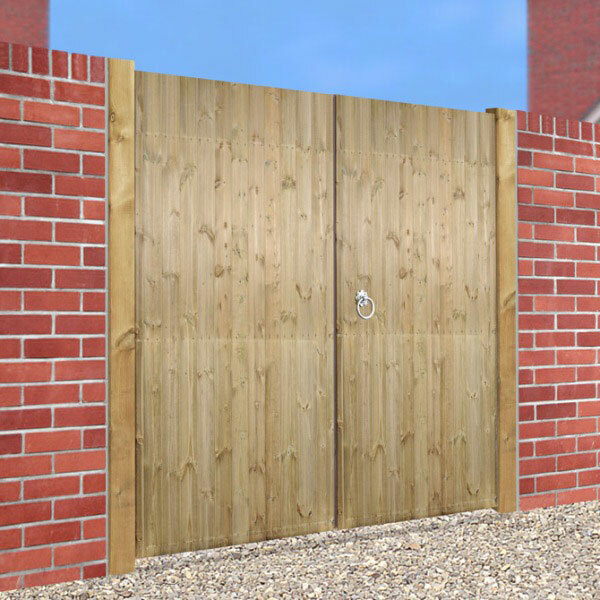 The Carlton Flat Top Double Gates are a pair of solid wooden gates, ideal for securing narrow driveways, or pathways that are too wide for a single gate. The gates are constructed from smooth planed Scandinavian Redwood which has been pressure treated for a long, maintenance free life. 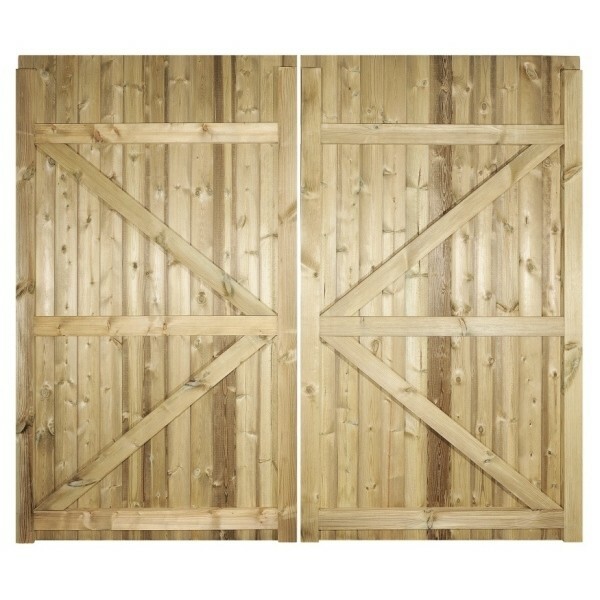 The front boards are a tongue and groove construction that creates a solid gate with no gaps for maximum privacy. The back of each gate has two vertical, three horizontal and two diagonal braces for improved strength and rigidity. The top of the gates are flat, with an overall height of 1800mm (71”). 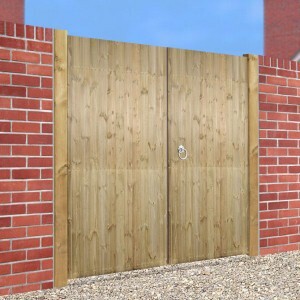 It is recommended that wooden gate posts are used when installing these gates. Optional smooth sawn 75mm square pressure treated posts are available. An optional galvanised fittings pack that includes a Ring Latch, four 16" Medium Tee Hinges and a drop bolt is also available. *Please note that the Gate Width refers to the total width of the pair of gates, not each gate. If our standard sizes won't fit, a made to measure service is available for this gate. Please click the tab below to be directed to the made to measure page. See size chart below to calculate how much space you will require to install your gate when using our 7.5cm square concrete in posts. Fittings. The Carlton gates are not supplied with any fittings; however an optional fittings pack is available which includes the correct size hinges and latch for this type of gate, plus a drop bolt to hold them closed. The fittings we have available are galvanised to prevent rust. Each gate has three horizontal braces on the back. Hinges should be fitted to the top and bottom brace. In very windy locations, a third hinge can be fitted to the middle brace for extra support if required (not supplied). Wooden Posts. Posts should be dug in approximately 60cm deep and held in place with concrete, or bolted to the wall using masonry bolts or frame fixing screws. A small gap must be left between the post and the gate to allow for expansion of the wood. Finish. The Carlton gates are supplied pressure treated which leaves the wood with a temporary green tint. If left to weather, the wood will fade to a silvery grey colour; however you can change the colour by painting or staining the wood after it has been allowed to weather for at least 2 months. If you wish to do this, you should use a paint or stain that is compatible with pressure treated timber.